I’ve loved the smell of coffee since I was a young child. After my grandfather came to live with us, I was responsible for brewing his coffee every day. When I say brew, I’m using the term loosely because we didn’t have a coffee brewer. Instead, I took a few scoops of instant coffee and placed them in a pot of boiling water. As I stirred the pot, the fresh coffee aroma delighted my senses and I yearned for a taste of the sweet nectar. My grandfather liked his coffee black – no sugar, no cream. After I served him his drink, I would sneak back into the kitchen and make myself a little cup of coffee with two teaspoons of sugar. It was delicious and I savored every moment (my mother forbade me to drink coffee because she believed it would stunt my growth). Coffee has evolved significantly since then. My grandfather would be amazed by all of the options that are available today. He’d probably never drink a frappaccino or cafe au lait, but he would be interested in the process used to make them. 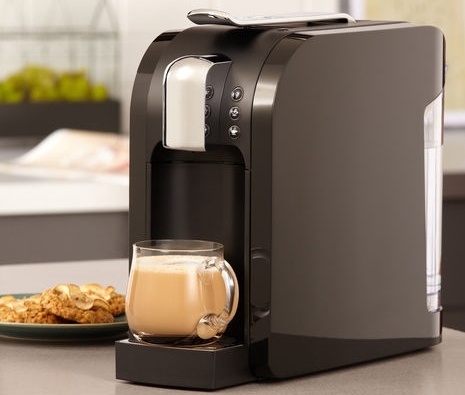 I’ve used several coffee brewing options in my lifetime, but my new favorite is the Starbucks Verismo Single Cup System. It delivers perfectly crafted Starbucks cafe quality lattes, expresso and brewed coffee using Swiss engineered high-pressure technology. I often buy packaged Starbucks coffee and brew it at home, but I end up wasting most of it because I never drink the whole pot. With this single cup brewer, I only make as much as I want to drink. I like the machine’s design. It is sleek and doesn’t take up too much space on my countertop. The machine is also easy to use. All you have to do is fill the water tank, insert a coffee pod (Pods are available in Expresso Roast, Decaf Expresso Roast, as well as the full Starbucks Coffee Roast Spectrum), and press the appropriate brew button. But my favorite thing about my Verismo is the delicious coffee that it delivers. My favorite drink is a freshly brewed caffe latte (2 shots of expresso with sweet steamed milk). I like the bold, creamy flavor of the drink. It is comforting and tasty. I wish my grandfather were still around to enjoy a cup with me. If you want to brew your own Starbucks quality drinks at home, you should definitely considered purchasing a Verismo. Two machine models are available – 580 (base) and V-585 (premium) – at Verismo.com, Starbucks stores, and specialty retailers.